Are you looking for new ways to earn money? Do you want to generate extraordinary profits? Do you want to take benefit from an attractive business opportunity? 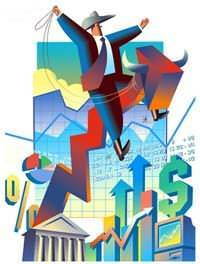 If yes then it is the time to do stock trading particularly futures trading as it has greater opportunities for growth. A large number of people invest in stocks every day but only a few of them get abnormal returns. This is because they have sufficient knowledge as well as experience in futures trading but what, if you do not have any experience in this niche. In this case, you have to take the services of futures brokers. Futures brokers are experienced individuals who are expert in futures trading. They are aware of the secrets of stock market, as they remain in touch with the management and higher authorities. Their analysis is near to accurate and their decision-making skills are very sharp. Their main job is to take investment decisions at right time on our behalf. They keep an eye on existing trends of various organizations in order to make trading strategy accordingly. For 2011, the largest stock broker by trading value was CIMB Investment Bank with 10.36 percent from total trading value up from 9.80 in 2010. On the other hand, the largest trading volume was OSK Investment Bank with 11.85 percent of trading volume but only 6.58 percent in term’s trading value. Seem like, people who trade via OSK like to invest in penny stock! Generally, in 2011 total trading volume & value were higher when compare to 2010. Trading volume up 30% from 506,498 million in 2010 shares to 658,463 in 2011 while trading value up 12.2 % from 780,723 in 2010 to 876,334 in 2011. The table below shows top 15 largest stock brokers trade in Bursa Malaysia in 2011 based on Trading Value and Trading Volume. RHB Investment Bank (RHB) is the first investment bank in Malaysia to be certified by Bursa Malaysia to offer Direct Market Access Equity (DMA Equity) services to clients. RHB utilize the system that was provided by US-based software maker, SunGuard. Direct Market Access (DMA) infrastructure for the equity market was put up by the Bursa Malaysia last year. With the DMA platform, clients would be able to react quickly to information flows and to self-manage limit orders in the market. The system will allows large transaction to be executed cheaper and faster.